Eye For Beauty: Miss USA Review: OMG IMG - WHERE ARE YOU GOING WITH THIS? 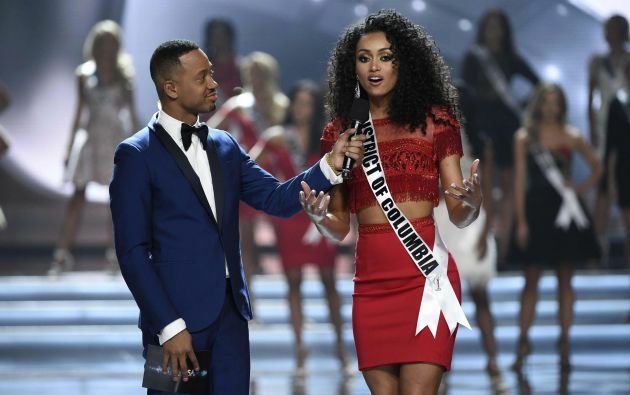 Miss USA Review: OMG IMG - WHERE ARE YOU GOING WITH THIS? I had a whole article planned about my thoughts regarding the most recent Miss USA Pageant. Then I watched the Shandi and Susie recap below and they pretty much hit the nail on the head. Bravo to these two fearless, fabulous ladies for being outspoken and "telling it like it is". I couldn't have said it any better myself, so I won't. I will just add a few of my random thoughts. I was delighted when I read that WME/IMG was taking over the Miss Universe Organization. I expected big things, but I also knew that some major rebranding was needed to move the pageant away from the Trump era. Trust me, I understand that they need to get as far away as possible from the former image of the organization, but so far I am not exactly sure if they really know where they are going with this. It was only recently that I watched Miss USA 2016 (which I pretty much skipped due to personal reasons), but comparing the 66th pageant to the 65th opened my eyes. While I thought the 2016 was brilliantly done (production-wise), I found that the 66th edition of the pageant was quite lacklustre. THE BUDGET EDITION: Is this the best you can do WME/IMG? While the most recent edition of Miss Universe was just absolutely amazing thanks to the amazing fans in the Philippines, I thought Miss USA 2017 was pretty much a non-event. I do understand that they probably had no to little funding, but they are taking away the soul of the pageant. It was absolutely disappointing to see that the girls did very little in Vegas and when they were out and about, it was always the same faces who were featured. That is a major concern and I can't imagine the state directors being happy with that at all. photos even before the start of the pageant. Now they are lucky if they get one. Also, in their attempt to rebrand the pageant, the organization has taken away the soul of the pageant. The fans loved all the photos we saw in recent years. You can still do beautiful evening gown shoots, swimsuit shoots, glam shots and head shots without losing the "substance" of the new image they are going for. The fans want to get to see the girls. It's hard to be invested in the event, when you take away what we love. they don't even get an amazing experience... just a low budget ten day affair. The whole event this year seemed like a rushed attempt to get it over and done with. Now I do understand that a host city might have fallen through and they were moving everything earlier to ensure Miss Universe will be held in the same calendar year (YAY to that), but don't let the quality of the pageant suffer just because it is a ten day event. It's still a pageant! Keep it a pageant! opening segment of this year's pageant. In their attempt to revamp the image of the pageant, it seems like the organization is embarrassed to do a traditional pageant. I hated the opening of the pageant this year. It was so rushed. The state directors (and national directors at Miss Universe) pay so much in franchise fees and put in so much effort into running their pageants that seeing the girls introduced in one second is an absolute insult. I hated it at Miss World in the past and they have thankfully listened and changed that. Now Miss USA / Miss Universe is doing it. At Miss USA 2016 they got it so right, yet at Miss Universe 2016 and Miss USA 2017 it was just absolutely awful. out individually. The swimsuit and evening gown parades were probably not even ten minutes of this year's show. I also hate the fact that the swimsuit and evening gowns are so rushed now. The organization is so desperate to get away from the cattle parade image that they are just ruining it now. It's almost like the girls have to run across stage, just to check off these two rounds without people really noticing that they took place. It can't be all about the questions. Don't take away what we love. You can do two elegant rounds of competition that are classy AND not make it look like a cattle market. If you continue doing this, you will lose most of your fans. And for goodness sake, don't let the girls come up in groups. They work so hard for this - give them a chance to shine... individually!!! Like Susie and Shandi said, less variety concert and more pageant, please!!! I also hate the fact that they are cutting down the number of semi-finalists. Yes, I love getting to know the girls, but I have major issues with just 10 at USA and 12(13) at Universe. I could live with 12 at USA and 15 at Universe. Hurray to you for eliminating the sash factor though. Love seeing new countries and states with weaker sashes making it at both pageants. DIVERSITY AND BACK STORY! YAY AND YAWN! I love diversity and I love getting to know the girls, but it's all getting a bit too much now. Just like the whole Miss Universe "mistake" was shoved down our throats until we felt sick of it and still do, the same is being with their need to let us know they embrace diversity. You should not have to say it so much, just like you should not have worn out the Steve Harvey mistake. Even my friends who are non-pageant people started rolling their eyes and commented on how annoying it was that they really beat that drum to death at Miss Universe. The same goes for diversity at Miss USA. If I had $10 for every time they said it, I could have gone on a super luxurious holiday. I am all for having a woman of substance being Miss USA (and Miss Universe - like in the good old days) but you don't have to try and undo the damage of the Trump era by going to the extreme. It seems like you MUST have some kind of amazing life story to be noticed. It's all about showing it on television and making an impact. I guess normal people who just want to do well in life aren't included in the diversity of the pageant. One thing that I really hated at Miss USA in the last two years is that it was pretty apparent who the organization wanted to win. The army and scientist stories were so highly promoted that it was clear who the organizers wanted. Don't get me wrong, I adore Deshauna and Kara, but don't shove these things down our throats to promote your new image. It made me feel that no other girl really stood a chance and that is super disappointing. It might undo some damage now, but it will cause more damage in the long run. However, I do support you in your endeavour to rebrand the pageant, I just really don't like how you are doing it. Your ratings are not looking good - you are in trouble. It's time to rethink how you schedule the pageant. I can't tell you how or when you should have it, but I don't think having the pageant on a Sunday night works. USA spends most of her time in New York City. It's time that Miss USA goes back to the people. I feel strongly about the fact that Miss USA should travel around the USA during her reign. Take the winner to the people. In this day and age, it's important for Miss USA to be everywhere during her reign. This will ensure longevity for your brand. How many states does the winner go to? Do the normal people still know who she is? Miss America is much more visible around the whole USA during her reign. The exact same thing goes for Miss Universe. It's sad to see them not travel around the world like in the good old days. I understand that times are tough, but if you are more flexible, your winners will still be invited. It's sad to see Miss Universe only visiting about 10 - 12 countries nowadays instead of 30 in the past! There are many things I like about the new organization, but OMG, IMG... where are you going with this? Don't lose the soul of your pageants just to prove a few points quickly! For me, what hurt Miss USA 2017 is that the fan vote was "vetoed" by the MUO. We as fans really do love the fact that WE get to have an input by selecting a delegate through the first cut. And I agree, the time that each of the Top 10-13 received at the last Miss USA and Miss Universe was cut dramatically. The delegates back from the early 70s to last year had more time on stage than the last two pageants. And to point out, the pageants were TWO hours!!! Hopefully Paula and the MUO will listen to the fans (Plus read the EyeForBeauty Blog and see what we have to say to take the organization to the next level.